Last time I was in a local pet shop some new, bright fish caught my eye. I recognized their body shape, but the colors…I don’t belong to those who support the idea of genetic modification of fishes, but in this case the fish really deserves to be spoken about. So, let me introduce you a GloFish! As you may guess, such fish can not be encountered in the wild. 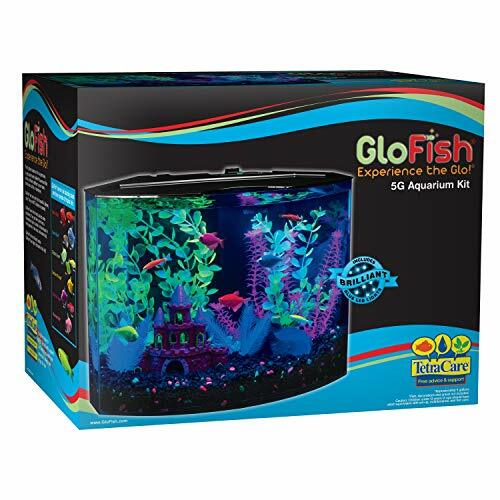 GloFish — is a patented commercial brand that sells genetically modified fluorescent tank fishes. The name contains two words: glow and fish. This is the name of the brand that sells transgenic fishes in the USA, but Taikong Corp in Taiwan is considered to be the official breeder of these fishes. The fishes were genetically modified to obtain this bright neon glow. Gene of one of Pacific jellyfish species was put into the fish DNA to ensure synthesis of green fluorescent protein to make the fish glow. This is how GloFish appeared! The first fish to get this gene was zebrafish (Danio rerio) — these are not demanding and popular cyprinoid tank fishes. These transgenic fishes differ from their initial form with their body coloring. The fish DNA contains DNA of a jellyfish (Aequorea Victoria) and red coral (from Discosoma genus). Zebrafish with jellyfish DNA paragraph (GFP gene) are green colored, with the coral DNA (RFP gene) — they are red, and the fishes with DNA paragraphs of both the jellyfish and the coral are yellow colored. Due to these foreign proteins the fish glow brightly in UV light. Initially the experiments had scientific purpose: the fishes had to act as indicators of water pollution, i.e. when there are some dangerous toxic substances in the water the fish should change its color. During one of scientific conferences the picture of transgenic fish was shown to the public and it appeared to be very interesting to representative of a company that was selling tank fishes. As a result, the scientists got the job to create another fluorescent fish species. Scientific and business collaboration has led to signing the agreement and appearance of a new brand GloFish, that is now selling different kinds of fluorescent fishes. Nowadays, there are the following colors of fluorescent fishes: Starfire Red; Sunburst Orange; Electric Green; Galactic Purple; Cosmic Blue. All species have fluorescent coloring once they are born and it remains through the whole life of the fish and becomes brighter as the fish grows. This fluorescent coloring is transferred to their offspring when breeding of transgenic species. In 2012 a new a new species of fluorescent tank fish appeared, it was named «Electric Green» GloFish. This fish was bred the same way as the previous ones, but instead zebrafish they used black tetra (Gymnocorymbus ternetzi). In 2015 tiger barb (Puntius tetrazona) glowing with green was introduced on the market. Only a short time ago glo-Rainbow Shark (Epalzeorhynchos frenatum) appeared on sale. In 2012 the same company executed an order to create fluorescent black tetra. Thus, due to joint efforts of scientists and business decorative aquarium husbandry has obtained unique fish species that allow to create completely new glowing tank design. Except their fluorescent glow transgenic fishes don’t differ much from their initial natural forms. Their size, lifespan, behavior and diet are almost the same, but they have some nuances. Even their lifespan doesn’t differ from this of ordinary black tetra – it equals to 3-5 years. For example, they don’t have any visual sexual dimorphism, since both males and females have the same coloring. The only difference they have is that female fishes have more rounded abdomen. The fish is not demanding to tank parameters, though it’s better to choose not very deep elongated volume with a cover. Tank plants should leave some open spaces for the fish to swim. GloFish tetra is the same enduring as a common black tetra. This is an active fish that swims in medium and low tank water layers. The fish is perfect for community tanks, though they may become less active if not kept in groups large enough. Black tetra feels more comfortable and behave better in groups of 6-8 fish and more. You can feed them with various food: flakes, small pellets and frozen food (daphnia, brine shrimp, cyclops, blood worm etc.). Glowing coloring of tetra will not change or disappear – it is put in their genetic pattern and it will be transferred to their offspring. To see how the fish glows it’s better to provide them with blue lighting. The coloring will be bright at white (ordinary) lighting, but not as bright as it could be. Due to glowing tetra brightness and unpretentiousness it is easy to keep them even for beginning aquarists. Due to the genetic scientists work a picturesque Electric Green GloFish Barb appeared in 2012. It was bright green yellow with barely seen vertical stripes and fins with red edges. In 2015 a new «high-contrast» barb with black stripes and black fins appeared and the red one appeared a bit later. Except their fluorescent glow the fish doesn’t differ much from its natural original species. Their size, lifespan, behavior and diet is almost the same. They are not demanding as for tank parameters, but it’s better to choose not very deep elongated volume with a cover. Tank plants should leave some open space for the fish to swim. GloFish Barb is the same enduring as a common tiger barb. This is an active fish that swims in medium and low tank water layers. The fish is perfect for community tanks, though they may become less active if not kept in groups that are large enough. Tiger barb feels more comfortable and behave better in groups of 6-8 fish and more. The fish diet can consist of various food: flakes, small pellets and frozen food (daphnia, brine shrimp, cyclops, blood worm etc.). 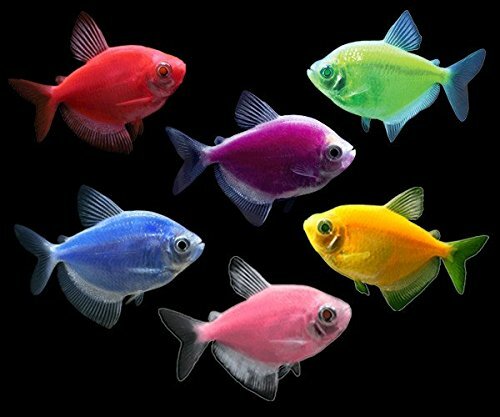 GloFish fluorescent fish are born brilliant! They are not injected or dyed. Add more color to your aquarium! All orders automatically upgraded to overnight shipping. *See product description for more shipping information. As you know now – the above mentioned fishes are modified version of fishes that inhabit in the wild. Before buying modified fishes I recommend you to read our articles about Red-tailed black shark and rainbow shark. These fishes are graceful, good-looking, active, but not as harmless as they may seem, therefore it is strange, that the company chose them to perform its experiments. The thing is that, first of all such modified fishes are bought by beginners attracted with their appearance and they may become quite disappointed later, when they find out that genetically modified fishes are not that easy to keep.